A sluggish day for the market overall wasn't keeping down credit-card issuer Discover (DFS) and online auction site eBay (EBAY), as shareholders of both companies got rewarded for a new deal between the two. Starting with Discover, it was hitting an all-time high Wednesday after it struck an agreement with eBay unit PayPal that will let shoppers use their online payment accounts in physical stores. More than 7 million merchant locations are expected to be involved in the system in the U.S., which will take the PayPal option beyond home computer screens and to the store counters themselves. The system will be available next year. Discover traded to a point it had never seen previously, according to FactSet, climbing to $39.14 at its session peak. The stock began trading in July 2007, when it was spun off from Morgan Stanley (MS). Meanwhile, eBay was revisiting some of the best days in its history. At the day's top of $48.08, it was matching its price of October 2004. eBay's all-time high was $53.19, adjusted for stock splits, in January 2005, FactSet says. Both stocks were having much better showings than U.S. stocks in general. The Dow was down 0.6%, and the S&P 500 was lower by 0.4%. On the New York Stock Exchange, where Discover is listed, only about one-quarter of stocks were higher for the day, Yahoo! Finance data indicate. On the Nasdaq, home to eBay, about one-third of stocks were up. The PayPal-Discover deal continues the growth of digital payment systems in our everyday lives. For instance, Starbucks (SBUX) recently signed an agreement that will see Square process payments in its stores, and Google (GOOG) has the application Google Wallet that lets users tie their credit and debit card accounts to their cell phones. NetSpend Holdings (NTSP), a provider of reloadable prepaid debit cards, has been marketing a PayPal Prepaid MasterCard for several months. The card is issued by The Bancorp Bank. 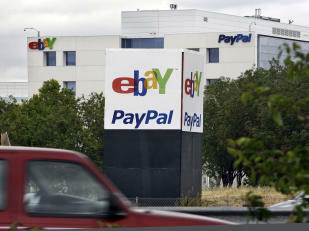 PayPal says it has 113 million active online customers around the world, with more than 50 million of those in the U.S.